Ene's Scarf (from Scarf Style) has been in my queue for ages (since before I actually had a queue, even!). 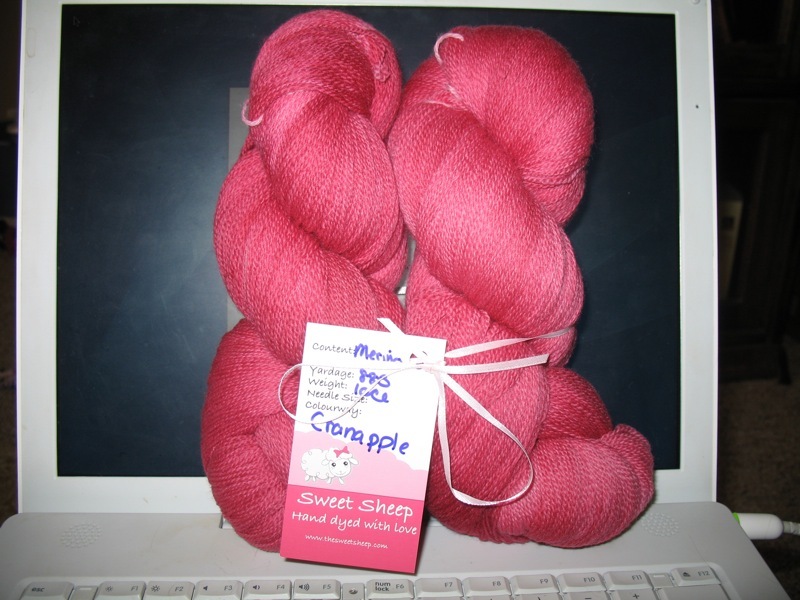 Then I got the Cherry Pie Laceweight from Amanda, and the two seemed perfect for each other. 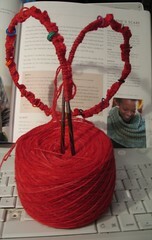 You can't tell it from the photo, but this yarn is just slightly variegated -- and is absolutely gorgeous. Another gorgeous scarf/yarn combo is Anne's Whispering Pines Triangle and the Sweet Sheep Laceweight in Cranapple, also marinating in my stash (although not for as long as the Cherry Pie had been -- and I'm suddenly seeing a pattern here with yarn names....). I talked myself out of casting on for it, because it's huge -- so I cast on for Ene's Scarf instead. 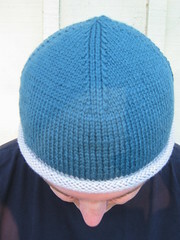 375 knitted cast-on stitches in doubled lace-weight yarn later, I came to my senses. 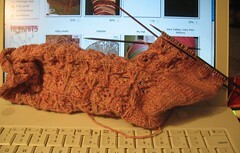 So Ene will have to wait a little longer, until I finish these socks. Even though this is the second sock, the short-row heel gave me fits, but I finally got it done, and am speeding on towards the toe. Oh -- and look what else I accomplished this weekend! My new armadillo tattoo -- one black and one white! 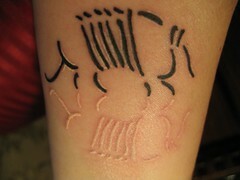 They're on the inside of my left arm, just above my wrist. The white one is closer to my wrist. It will be interesting to see how the white one looks once it's healed. White tattoos are very subtle, which is what I wanted, but Mark already told me he can go over it in a different color if it's too subtle. Love the armadillo! Hubby has a white tattoo--but he sunburned it shortly after getting it. Ah yeah...it doesn't look so good anymore! Neat armadillos. Have they made it there to Iowa yet? I once saw an armadillo on the side of the road and it freaked me out. Your tatt is gorgeous! It's so original and all kinds of fantastic. OMG! I love the armadillo! I can't wait to see your finished shawl too.